Gaon; head of the academy at Bagdad in the first half of the twelfth century. His name occurs in an old Arabic responsum (Harkavy, "Responsen der Geonim," p.186), also in "The Itinerary of Benjamin of Tudela" (ed. Asher, pp. 77 et seq. ; and in Sambari, ed. Neubauer, "Med. Jew. Chron." i. 123), where he figures as the master of David al-Roi, the clever pseudo-Messiah, whom, under the name of Alroy, Disraeli has made the hero of a romance (compare Grätz, "Gesch. d. Juden," 2d ed., vi. 269 et seq.). 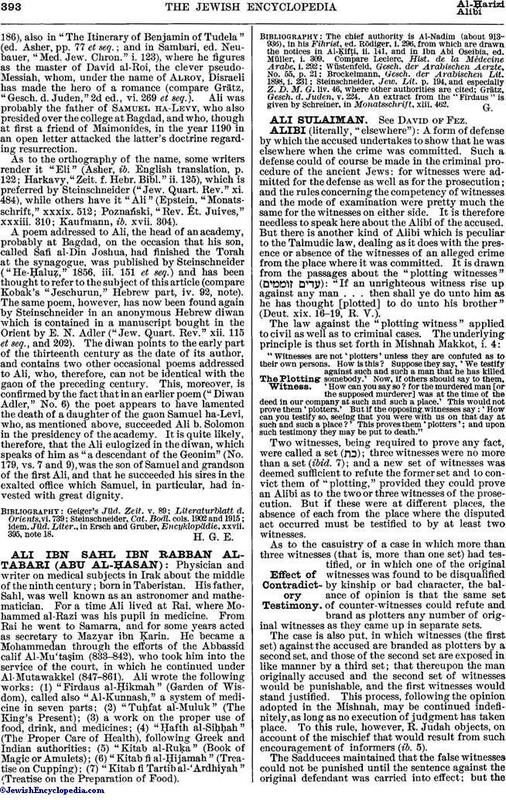 Ali was probably the father of Samuel ha-Levy, who also presided over the college at Bagdad, and who, though at first a friend of Maimonides, in the year 1190 in an open letter attacked the latter's doctrine regarding resurrection. As to the orthography of the name, some writers render it "Eli" (Asher, ib. English translation, p. 122; Harkavy, "Zeit. f. Hebr. Bibl." ii. 125), which is preferred by Steinschneider ("Jew. Quart. Rev." xi. 484), while others have it "Ali" (Epstein, "Monatsschrift," xxxix. 512; Poznański, "Rev. Ét. Juives," xxxiii. 310; Kaufmann, ib. xvii. 304). 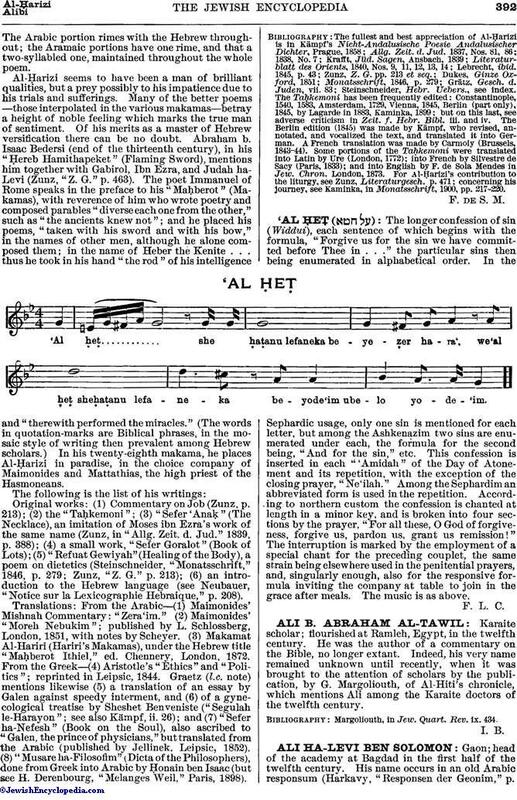 A poem addressed to Ali, the head of an academy, probably at Bagdad, on the occasion that his son, called Safi al-Din Joshua, had finished the Torah at the synagogue, was published by Steinschneider ("He-Ḥaluẓ," 1856, iii. 151 et seq.) and has been thought to refer to the subject of this article (compare Kobak's "Jeschurun," Hebrew part, iv. 92, note). The same poem, however, has now been found again by Steinschneider in an anonymous Hebrew diwan which is contained in a manuscript bought in the Orient by E. N. Adler ("Jew. Quart. Rev." xii. 115 et seq., and 202). The diwan points to the early part of the thirteenth century as the date of its author, and contains two other occasional poems addressed to Ali, who, therefore, can not be identical with the gaon of the preceding century. This, moreover, is confirmed by the fact that in an earlier poem ("Diwan Adler," No. 6) the poet appears to have lamented the death of a daughter of the gaon Samuel ha-Levi, who, as mentioned above, succeeded Ali b. Solomon in the presidency of the academy. It is quite likely, therefore, that the Ali eulogized in the diwan, which speaks of him as "a descendant of the Geonim" (No. 179, vs. 7 and 9), was the son of Samuel and grandson of the first Ali, and that he succeeded his sires in the exalted office which Samuel, in particular, had invested with great dignity. idem, Jüd. Liter., in Ersch and Gruber, Encyklopädie, xxvii. 395, note 18.